It is always exciting to hear a Tolkien friend is about to have a book released, but this time it also was a big surprise. Jason Fisher managed to gather around him a group of the greatest Tolkien scholars, like Tom Shippey, John D. Rateliff, Diana Pavlac Glyer and Thomas Honnoger, and finish the project of his dreams without most of us - other Tolkien fans - to know much about it. Since Tolkien drew from many disparate sources, an understanding of these sources, as well as how and why he incorporated them, can enhance readers’ appreciation. This set of new essays by leading Tolkien scholars describes the theory and methodology for proper source criticism and provides practical demonstrations of the approach. From the first moment I heard Jason Fisher talk about the project I realized that this book is the result of a person with a passion and a study that never was published before. Jason Fisher even managed to get permission to publish some new material by J.R.R. Tolkien, making this book something special and unique and a must have for every serious Tolkien fan! So I'm double happy to announce this interview with Jason Fisher about his book Tolkien and the Study of His Sources - Critical Essays. TL: Can you tell us first a little about yourself? JF: Yes, happily. I am an independent literary and linguistic scholar living in Dallas, Texas, in the south-central part of the United States. My primary areas of research are J.R.R. Tolkien, the Inklings, and fantasy literature more generally, as well as medieval Germanic language, literature, and comparative philology, with special emphases on Old and Middle English and Old Norse. I have been reading Tolkien for more than thirty years, but I have become more active in the scholarly world only over the last third of that time. My first published piece of a scholarly nature celebrates its decennial next year. I have also been writing a blog on Tolkien and related topics (lingwe.blogspot.com) for the past four years. Since the spring of 2010, I have been editor of Mythprint, the monthly publication of the Mythopoeic Society (www.mythsoc.org). TL: Can you tell us about your upcoming book &quot;Tolkien and the Study of his Sources&quot;? JF: It is a collection of essays on the subject of source criticism as applied to the works of Tolkien. The book is divided roughly into two parts (not of equal size). In the first part, a preface and three essays lay out the background and history of Tolkienian source study, as well as discussing its methodology (i.e., the right versus the wrong way to do it), its pitfalls, and its rewards. These essays are written by Tom Shippey, Edward Risden, and myself. The remainder of the book aims to provide practical examples of Tolkienian source criticism, with the goal of representing as broadly as possible the gamut of Tolkien's works as well as the whole historical and literary range of his influences. 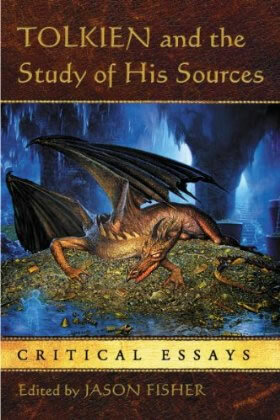 These individual source studies are also written by leading lights in the Tolkien community, by scholars such as John D. Rateliff, Thomas Honegger, Diana Pavlac Glyer, Kristine Larsen, and others. The full table of contents is available on McFarland's website (www.mcfarlandpub.com). TL: We have seen a lot of essays and work on Tolkien by your hand, but this book seems to be the one you are most excited about, what does this book mean to you? JF: Apart from the unforgettable experience of working with such a magnificent assortment of collaborators, most especially Tom Shippey, this book essentially sums up my entire view of source criticism, the field of Tolkien studies which has always excited me most. In my own individual essays over the years, as you point out, I have had the chance to make the case for this or that specific source, but in this book, I present a broad view of the entire discipline, as well as a wide-ranging collection of examples, each of which speaks to a different side of Tolkien, and all of which work together to make a single, cogent argument about his work. I hope that readers will not only be excited by the discoveries of certain individual sources, but will also see the significance and validity of source criticism (when it is done well). Most importantly, I hope readers of the book will come to appreciate Tolkien's imagination and craftsmanship more, not less, by the time they have turned the final page. TL: Is it correct that for this book there was no such thing as a 'call for papers'? Why did you keep the project secret? JF: I didn't keep the book secret, per se, or at least, I did not mean to; I merely kept it quiet until it was far enough along that I wouldn't be testing the patience of interested readers. But you are right: there was never a public call for papers. The reason is that the included essayists all joined the project at my personal invitation. And there were so many eager participants from among the top tier of Tolkien scholars that there was never any need to issue a public call. At the risk of putting the cart before the horse, there has already been a little talk of the possibility of a second volume in a year or two. If that indeed comes to pass, I will certainly open the project up to a wider pool of potential contributors. TL: How did you go on selecting topics, authors and keep track of the overview in this project? JF: My principal goals were to cover the broadest historical range possible in a collection of a reasonable size. As you know, my own studies focus primarily on medieval Germanic source material, but I did not want the book to lean too disproportionately in that direction, so I was careful to include only one such study (this is the one by Thomas Honegger). I wanted to begin with biblical mythopoeic, at the very dawn of recorded history, and proceed all the way up to Tolkien's own lifetime, covering as many periods as possible along the way -- Greek and Roman mythology, Late Antiquity, the Middle Ages, the Renaissance, the Victorian and Edwardian periods, and even influences by Tolkien's contemporaries. In addition, I had specific goals for addressing the background and methodology of source criticism more generally. This helped shape the book from an early stage, and it also helped suggest specific scholars whose research areas accorded with my design of the book. Keeping track of everything was a whole different job! The amount of editing work to bring the entire collection into harmony after I had received all of the individual essays was considerable. TL: Is there any unpublished material inside the book? JF: Yes, there is a small amount of new primary material, comprising quotations from six unpublished letters by Tolkien (held by various private owners), as well as quotations from Tolkien's unpublished lecture notes on the Goths (in the Bodleian Library). This material is used with the kind permission of the Tolkien Estate. In addition, there are some details about the John Boorman screen treatment for The Lord of the Rings, which I believe is also unpublished. TL: How long did it take to get this project on the road, find a publisher and get the book ready for publication? JF: The original inklings of the idea took shape during the 39th annual Mythopoeic Conference in late summer, 2008. Within a month or two, I had put together the general outline of the book and begun approaching the first scholars. That process continued for several more months, and then it was another year or so before I had received final drafts of all the contributors' essays. Final editing took perhaps another six months. Finding the publisher was actually the quickest part of the process. I approached McFarland at the end of 2010, and they accepted the proposal immediately. I delivered the manuscript at the beginning of February, and here we now are. TL: Having now studied all Tolkien sources did you find an answer to why Tolkien has been so popular with readers? JF: First, I would never dare claim to have studied all of Tolkien's sources! I think there is still a lot of work yet to be done there. But having studied perhaps more than most Tolkien scholars, I can say that I think one reason -- and it is indeed only one reason; source criticism is hardly a panacea; there are many other equally productive and rewarding approaches -- but one reason Tolkien has been so popular is that his works contain &quot;elements in solution&quot; of so many other works, authors, folktales, legends, and myths, that there is something immediately welcoming and familiar about his works, even when it is buried well beneath the surface. We feel as if we've been here before somehow, or in some other life. In a very real sense, we have. This, of course, does nothing to diminish Tolkien's imagination or craftsmanship. If anything, it gives us that much greater reason to appreciate them. JF: That is a much different question, and one to which many other scholars have attempted an answer, so I will only say a little. I think there are many reasons, and most of them really miss the point of what Tolkien was attempting in his writing. The wish to restore to England a native mythology lost during Roman occupation, Christianization, and Norman conquest is not one that would appeal to most critics. &quot;Why would he do it?&quot;, as John Gardner once asked. Similarly, the creation of a comparative and historical linguistic substrate, complete with perhaps two dozen invented languages, is (to most literary critics) unfathomably strange. But then, critics dismiss a great deal -- they dismiss far more than they accept, generally. Tolkien is hardly the only author dismissed. And even as Tolkien begins to find greater acceptance in the academy at long last, there is a new target of derision from entrenched academicians: J.K. Rowling. TL: Compared to Tolkien's sources, what does remain unique in Tolkien's work? JF: One thing that is unique is Tolkien's use of source material, the ways in which he interleaved and layered many different, and sometimes contradictory, sources into a single, coherent system. Other authors who have borrowed from earlier sources have rarely (if ever) done this, and certainly with nothing like the complexity of Tolkien's works. But since I think you mean to ask what is unique in Tolkien apart from his sources, one good example is his glossopoeia. Very, very few authors have invented languages for their fiction. Of the ones who have, most of their invented languages are nothing more than a random assortment of made-up words, without any regard to phonology or grammar. Of the extremely small number who have made some attempt at a grammar or phonology, there is absolutely no one, apart from Tolkien, who has ever developed an entire system of historical lingustics and comparative philology, with multiple interrelated languages. It is, quite simply, a unique and astonishing achievement. And in spite of Tolkien's huge influence on subsequent fantasy writers, no one has ever done it since. Tolkien is inimitable. TL: We should of course read the introduction by Tom Shippey, but &quot;why source criticism&quot;? JF: Tom Shippey sets the stage for the rest of the book by confronting right from the start the central question of why we should undertake source criticism, particularly when Tolkien himself grumbled about it. Shippey identifies the central issues behind Tolkien's apparent distaste for the approach, and at the same time he points out what source criticism has to offer, regardless of the target author's opinions of it. Without a satisfactory answer to &quot;why source criticism&quot;, what would be the point of reading any further? This is one criticism that is often (fairly) leveled against source studies: that while they point out similarities and possible influences, they sometimes fail to explain why anybody should care. What can we learn from the discovery, and how does it inform our appreciation of what Tolkien has done? Fortunately, Shippey's answers to these questions are, like everything he has written, far, far better than merely satisfactory. JF: I have several different hopes, targeted to different kinds of readers. To readers who wish to undertake their own source studies, I hope to offer a kind of road map to successful source criticism. To readers who reject source criticism as a valid approach, I confess I hope to win them over. To readers who think that the use of source material means that Tolkien was unoriginal, I hope to show that his choice and use of source materials were profoundly original. To readers who have had no idea the depth and breadth of Tolkien's complex use of source material, I hope to introduce the subject and give them a sense of staggerment at the man's brilliance, leaving them rather like Gimli in the Caves of Aglarond. To all readers, I hope to magnify their appreciation of Tolkien's works. TL: I believe the book to be done very well. It succeeds in bringing together what you were planning to assemble, and thus it is a very constructive contribution in the field of Tolkien Study. Is this also the opinion of the contributors or others who have already read the book? JF: Thank you! I certainly hope the book is as well received by everyone. Not all of the contributors have read the entire book yet, but those who have gave a similar opinion. In addition, Verlyn Flieger, Marjorie Burns, and Douglas Anderson all read the book in the proof stage and contributed blurbs for the back cover. All three of them feel the book is a successful and strong addition to the secondary literature on Tolkien: one that will &quot;stimulate readers and scholars alike&quot; (Flieger), &quot;a valuable book for anyone serious about Tolkien&quot; (Burns), with &quot;outstanding examples of the value of this approach&quot; (Anderson). I am very excited to begin hearing from more readers now that the book is being shipped! TL: Where do you place your book compared to other compilations of essays on Tolkien, for example how does it compare to Tolkien Studies? JF: So far as I know, my book is the first and only book of its kind on this subject. Many individual source studies have been published before this, but almost always as individual essays in journals. A few full-length books have been published before this which could be called source criticism (e.g., Tom Shippey's The Road to Middle-earth, or Stuart Lee and Elizabeth Solopova's The Keys of Middle-earth), but no book of which I am aware has attempted to lay out the methodology and background of the discipline, and then to survey Tolkien's sources systematically across the whole historical range of the western canon. My book really doesn't compare to most general collections of essays, in that such collections often have no overarching theme uniting the constituent, or when they do, that theme is not source criticism. Furthermore, I believe the essays in my collection harmonize and interrelate to one another much better than in most collections. There are frequent references from one essay in the collection to an earlier or later one, which is not particularly common in multicontributor collections. The idea is to present as complete a picture as possible, and I am very proud of the collection I have assembled. TL: Is this the beginning or will we see more books edited by you? JF: There will surely be more books edited by me, but I would also like to write books entirely under my own steam, as it were. A collection comprised entirely of my own source studies is likely at some point, for example. I have some other ideas for monographs as well, but perhaps I should not tip my hand too soon. :) In the meantime, I keep quite busy with individual essays, conference papers, book reviews, and editing Mythprint. TL: One final question, are you following the The Hobbit movie news and as a Tolkien scholar how do you look to that project? JF: Indeed, I have been keeping an eye on developments with the films. I am one of those (apparently few) scholars who enjoyed and approved of Peter Jackson's Lord of the Rings. Film is an entirely different medium from books, and changes are inevitable and often beneficial. Not that approve of every change Peter Jackson made! The films were quite enjoyable, and I am really looking forward to seeing the two-part Hobbit. My only guarded concern at this point is that, with The Hobbit coming after The Lord of the Rings films, there will be a great temptation, probably inescapable, to base the mood, look, feel, and style of The Hobbit on that of The Lord of the Rings. This is probably a mistake, in the same way Tolkien's 1960 revision of The Hobbit was a mistake (fortunately, one he abandoned). The Hobbit, I think, calls for a lighter tough. But we will see!